In the tradition of great 3-D action jumping games, Crash Bandicoot is probably the PlayStation equivalent of the groundbreaking Nintendo 64 title Super Mario 64. Now repackaged as one of PlayStation's Greatest Hits, this top-selling game takes you away on a tropical island adventure that is filled with precarious enemies and challenging levels. Our spiky-haired hero Crash needs no weapons to survive the harsh jungle. Instead, he jumps, jogs, and spins his way through numerous lush and downright fun environments. I remember telling my mom and my little brother that this game looked stupid and that I didn't wanna play it when they first got a Playstation and this game. I finally gave in and played it however. After playing it for the first time, I got hooked and it was AWESOME. It has some of the best graphics I had seen at the time and most of the levels are fun. It got me hooked so bad, that my family couldn't get me away from it. I told them that I was going to beat the game first and that it was their fault that I got addicted to the game and wanted to beat it in my first few sittings because they had begged me to play it and now I couldn't quit playing it. This is a classic game that I come back to every now and again. The graphics are great and the content is really satisfying. But I do have a complaint of the actual difficulty of the game. 1st island - The easiest to beat if you have all of the different coloured gems. The hardest level here is Native Fortress. 2nd island - Slightly harder but still fun. The hardest level here is Sunset Vista. 3rd island - The most frustrating. I spent half an hour to beat Generator Room with Perfect and another half an hour with Toxic Waste. The hardest level here is Slippery Climb. I remember when I first got this game with a Playstation console in early 1998. It was a great phenomenon then, because the Crash Bandicoot series was able to bring some new life to the platforming genre of gaming with its 2D and 3D interchangeable levels. Crash must go through 25 levels and 6 bosses in this game, but unlike the later games in the series, Crash must tackle the levels chronologically by progressively going through 3 islands. While the gameplay is fun and interesting, the game has its flaws as well. First off, you can only save when you either complete a bonus round (which can only be access one time in each level) or when you collect a gem for destroying every crate in the level. This gets frustrating, because in order to get each gem, you must complete the level and break the boxes without losing a life, plus the fact that colored gems are required to complete certain levels. If I were you, I wouldn't worry about the box gems just yet and just try to find the bonus in the newer level you are at if you want to call it a day. You may have to do the newer level again, which tends to be a flaw. I like this game very much because it has cool music and sound. Mammels and there's one Cortex said "Crash should be a leader. when famous sonic was out now enter bandicoot. this story tell about myster that can be destoryed a dr neo cortex was a mad scitent which ordered nitus brio to create a animals but now cortex have created the bandicoot which can be there leader. The one that started it all! It's easy to tell. Crash Bandicoot, a Game or a Torture Device? I'm semi serious about this. This game is tough. It's an excellent platformer, one of the all time best for that matter, but some of the levels are rage inducing. Crash is the perfect mascot/icon for Sony and they let him go. At the time when Sony needed one, Crash was there and sold systems. He was the face of Playstation and it's baffling why they didn't hang on to him. Just ask Nintendo or Sega what the advantages of a mascot are. Nintendo is dead without Mario and after many failed attempts, Sega is still trying to resurrect Sonic. Crash was perfect for Sony. He's funny, has attitude, likable and recognizable and the games we're the first, really good 3D platformers for the next generation. He also provided a stable franchise for the younger audience, which every company knows they want and need. What happened here? Man, I remember the commercials when a guy in a Crash outfit went to Nintendo headquarters and stood outside with a bullhorn and was taunting Mario, daring him to come out. Classic. That was Crash. Sony really dropped the ball here. Crash has never been the same since Naughty Dog let him get away. Other developers have made some very uninspired sequels with him, changing his looks, alliances and even voice. I know you can't do the same thing forever but none have come close to the success of Naughty Dog, when they held the reins of this franchise. Today, Crash sits in a woeful state, being made to participate in very un-Crash-like games. This game started it all though. This changed the platformer forever. While Mario and Sonic we're still going left to right in their side scrolling adventures, Crash took us into his world with glorious 3D. It said something about the future of games and consoles at the same time and it was only on Playstation. Even today, this is a very challenging platformer. Amidst the Ratchet's, Jak's, Sly's and 3D Mario's and Sonic's, the original Crash is about as tough as there is. But it's also compelling enough to want to keep going. You never don't know how your going to get through the level (they're linear afterall), it's getting the right timing and touch to do what needs to be done. There are some truly insane levels here that will test all your patience and nerve. But you'll just want to keep trying, at least till you get to your next save point so you know you don't have to do the level again that you just did. Fortunately, there's plenty of fruit and extra lives, but your gonna need them all. The audio, video, and play mechanics in the original Crash trilogy are spot on. These games still look, sound and play great today. They're a very few of the only original PSone games I can bare to look at, let alone play anymore. The look is perfect with bright colors and varied enviornments and the music and sounds are catchy and perfect for each stage. These games have aged extremely well and are a real tribute to the developers at Naughty Dog. There are a couple of downsides though. These games are really tough, maybe too tough for the average gamer or especially child. Some of this is intentional design and some I feel maybe the fact that 3D platforming was in it's infancy at this time. Some of the angles on jumps, just seem a little off. The perspective can make it really tricky. Another problem is that the save points can be a little far between. Not the check points during the levels, they are plentiful and life saving, but the save points. Sometimes, I just wanted to finish a level I'd been on for a while, save and quit. But then I'd find that I had to go through another whole level and a half, just to get the bonus round/save point. And even the bonus round was tricky sometimes as it's set up as a mini level requiring you to get from one side to the other but if you fell along the way, you'd have to restart the level to get back to it. Again, more challenge and patience testing. My final complaint is that sometimes you'd have a nice number of lives you've accumulated from previous levels, say 20 or so, you save, come back and you only start with 4!!! I want my lives, I earned them!!! On a final note, I downloaded Crash on my PS3 but cant save as it wont, even though PS2 games do, so I have to use passwords. It's a little annoying but if they didn't provide them, then I'd really never be able to save. This game is definitely no Mario 64. 1.Bosses (bad guys) are way, way too easy if you're looking for a challenge. 2.Levels starting from Island 2 are extremely challenging. 3.Crash (your playing character) is too slow at the parts where ya gotta get stuff done! 4.Keys and colored gems are again, extremely hard to get. 5.Not too many power moves just plain old jump and spin. 5.Now going for cheaper than what it was when it first came out. 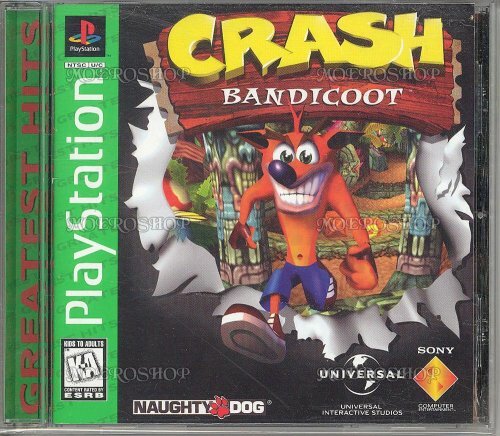 The BEST CRASH BANDICOOT GAME! That's right. In my opinion, this is my favorite Crash game for several reasons. First, we have the graphics, which are actually smoother then in Crash 2. The bosses are funny (LOL Papu Papu), and there are lots of levels and enough diversity for my taste. But, the only draw-back is that 4 of the levels are WAAY to hard. (Slippery Climb, Sunset Vista, Toxic Waste, Fumbling in the Dark) But, the levels being harder are for the better. I think this makes the game have more lasting appeal, and makes it far more addictive. Plus, the look Crash gives you on the Hog racing levels is Classic. PLOT: Crash Bandicoot is a mutated reject and a expirement gone wrong. N.Brio warns Cortex for throwing him out, but he does not budge. So Crash is seperated from his girl friend, Tawna. Meanwhile, a benevolent witch doctor named Aku Aku has scattered his spirit masks and treasures across the island, for Crash to follow and eventually lead his way up to Cortex's Laboratory. There are tons of tons of levels, from hopping across creeks, to running from rolling boulders, jumping to and fro from 5 ton stones, to scampering up a gate, to running through haunted temples and much much more. Overall, This is a fun, addictive, pretty, cheap, and difficult underrated gem in the vault of PS1 games. P.S. In the password screen, type T, T, T, T, X, S, T, T, T, T, S, X, T, S, T, T, T, C, S, T, X, X, X, X. Next, go to Castle Machinery and board the green gem. Augh! I found the first few levels of Crash 1 harder than the 3rd world levels Crash 2 and 3. It also uses a system of having to pass one level to get to the next. This becomes frustrating because I found myself having to repeat the same level over and over again because I either died or... hell, I don't know. I just had to repeat the level because it wouldn't let me continue. Also, there is no giant screen where you can save. You have to find the bonus platform, and make it all the way through the bonus part to save. Happen to fall through the cracks on the bonus? Sorry! You're just going to have to hope you don't die or else you'll have to repeat EVERYTHING. OVER. AGAIN. A little kid is going to get frustrated and give up on this game if you get it for him. Be nice to your children. Buy them Crash 2. Or 3. Or games from the Spyro series, that would work too.